I'm a real neophyte with drupal and FCKeditor as this is my first project. I'm using fixed width sky theme and trying to create tables in a new page content. No matter what column width settings I use, I cannot get columns to display properly. All the columns move down to another line. 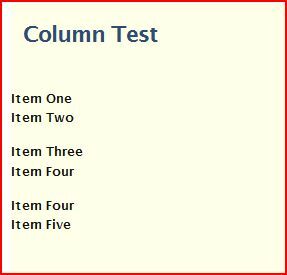 In other words, If I have a two column table, column one will display on line one and column two will drop down and display on line two. I cannot get the columns to display on the same line. I have tried many column width combinations using both pixels and percentage but nothing seems to work. Must be something easy but I can't figure it out. That problem doesn't have any relationship with FCKeditor.